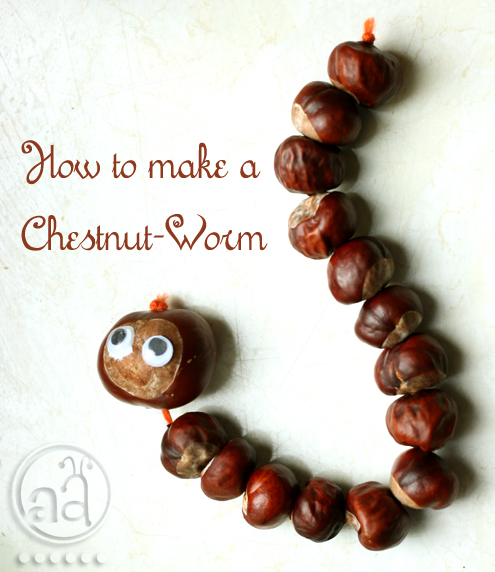 while looking for chestnut-related crafts i had found this cute idea. i really thought we would go for chestnut bugs, but then i remembered how fascinated the little man had been upon watching a rainworm in the park last sunday. in addition, the junebug had gotten a wooden toy in the shape of a worm that he was interested in as well. most of all, i really wanted to use up as many chestnuts as possible. 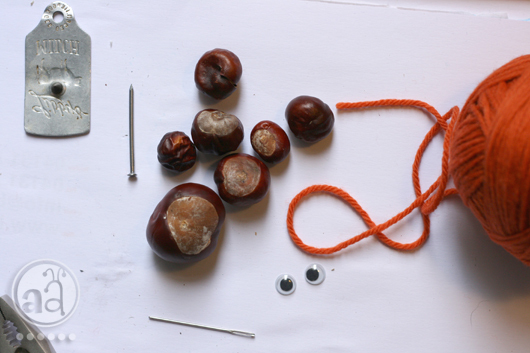 so, instead of making chestnut necklaces (maybe next time! ), we made a worm. 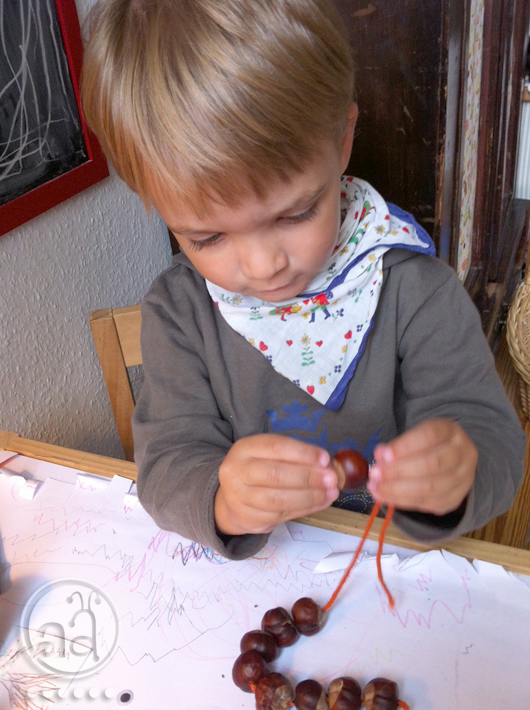 the little man enjoyed pulling the yarn through the chestnuts with a needle, mama's job was the drilling. 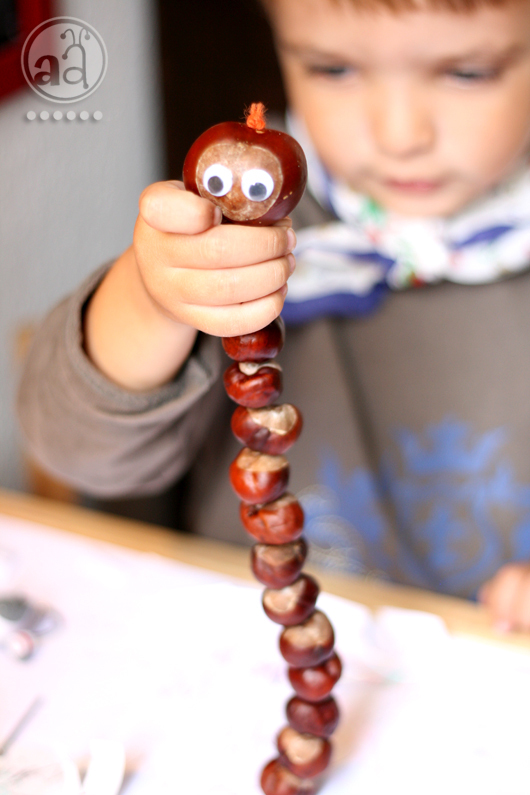 i'm thinking of taking it a step further next time and make a chestnut octopus :) but for now here he is, our chestnut-worm! would you like some more fall/autumn project ideas for kids? what a fun project, i love it! That is such a cool self-made toy to play with, and how neat that he got to help make it! how did you hold the buckeyes to drill them? @Linda Keller: I held the chestnuts in my hand. I used a little punch to make a small hole and then pushed the nail into the chestnut. They are quite soft, so it is safe for adult hands. After I "drilled" the hole, my little one threaded in the yarn with a blunt needle!